A PrestaShop development company can be easily found on the official PrestaShop site. 1. The generic version of the site is always an identical one to another copy. 2. The generic versions are not always updated with the latest eCommerce optimization trends and needs. 3. For example, there is a lot of difference between a generic checkout of PrestaShop and a Prestashop onepage checkout module. 4. The theme always remains same for the generic sites. They need a template development services to make them unique from any other site. 5. Advanced features do not come bundled. Features like abandoned cart management are only added with additional modules or extensions. 6. Today most of the top selling sites, have converted themselves into a marketplace. In this race the generic site lag behind the other sites where this feature can always be implemented in the generic sites by using a marketplace extension. These are just a glimpse of some advanced features where the generic sites lag behind the sites that are operated with services like PrestaShop development services. So, how can you get a perfect PrestaShop development company so that your site is equipped with the most advanced modules and features. The official site of PrestaShop addons is the best place to look for the best PrestaShop development companies. There still some very popular other sites to look on, but most of the PrestaShop development companies who sell on other sites, necessarily sell of PrestaShop addons too. If not, then better you avoid them. 1. They are certified and licensed- The PrestaShop development companies showcasing on Addons.PrestaShop are the one who have the official PrestaShop developer license and they are certified to work as an official PrestaShop development company. 2. They get the license after so many standard checks- The PrestaShop development companies on this site are certified to work as so only after going through a tough standard check by PrestaShop. These standards include the PrestaShop certification, competence to provide support to the customers, trust by the customers, payment, and information privacy etc. So, a company profile on this site alone is a proof of trust and authenticity of the PrestaShop development companies. 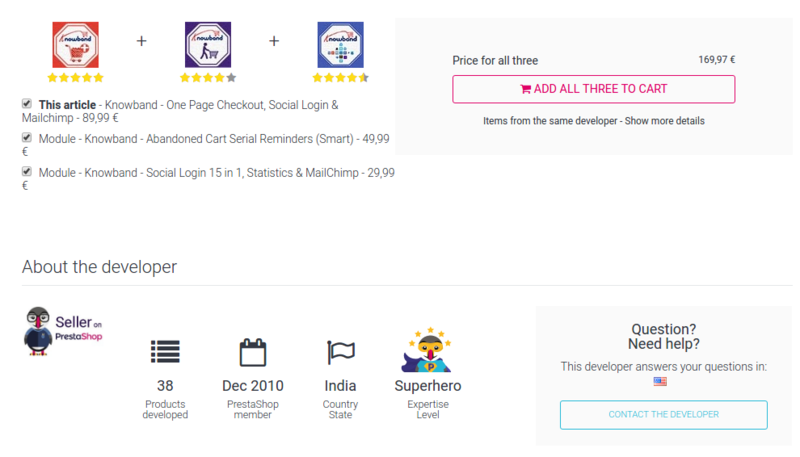 Example of a seller with Superhero badge on PrestaShop official site. Any PrestaShop development company get a level of rating by the customer, and these ratings are analyzed by the PrestaShop to provide a seller badge to the Company. Seller badge for awesome customer support is one of them. So, you can trust these companies for the quality of customer support by looking at their seller badges. For example, this is an example of a PrestaShop development company on the same site who has a “Superhero” Badge. How can you find the best sellers or PrestaShop development company on the Addons.prestashop? 1. Decide the module or feature you want- First of all, analyze your requirements with the site, get to know about the features you seek for your site. 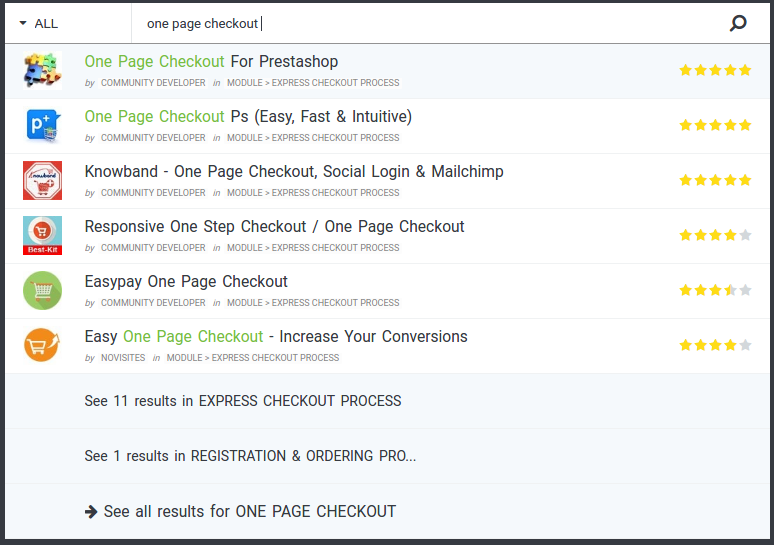 Say, you want to replace your default PrestaShop checkout with a one-page checkout process. In this case, you can go to the search box of the official site and put your search string “one-page checkout” in it. After you make the search, a number of one-page checkout modules would show in the search auto suggestion. Just open all or multiple numbers of suggestions in different tabs of your browser. 3. Compare the ratings and reviews- Each product on the gets the reviews and ratings by the genuine users who actually use these modules. These reviews help the other customers decide the best from the rest. The ratings are provided based on the different criteria to be fulfilled by the modules. As explained above, the seller badge is provided to PrestaShop development company or a developer according to the standards laid by the official PrestaShop. A seller badge is a combined rating by the PrestaShop to their sellers. These badges signify the quality of product and services provided by the particular PrestaShop development company. These are some basic as well as very crucial considerations that you should take into account when you are deciding any module from any PrestaShop development company.